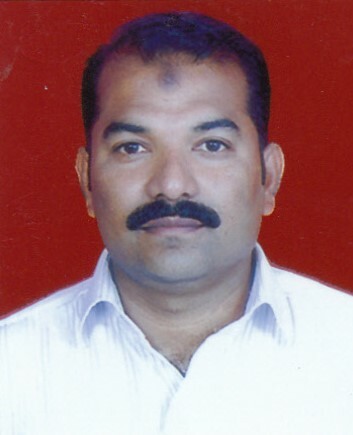 “Demand of rabbit meat is more but supply is less yet rabbit farm owners are incurring loss! I used to get many calls from existing rabbit rearing farmers saying that they are not earning much! I was worried about this. Nobody was finding the reason behind loss. Therefore I decided to conduct a research myself to find the reason and also craft the solution to help farmers earn better,” shares Mr. Rizwan Gangavali, rabbit breeder and trainer. He established Karavaki Rabbit Farm at Bhatkal, Karwar district, Karnataka exclusively for breeding and selling rabbits only to the rabbit farmers. If he receives order for rabbit meat then he buy-backs rabbits from his trainees and sell but his farm rabbits are always sold to the farmers. I did extensive research for one year to find out why rabbit farmers were incurring loss. Finally I could find out reason behind the loss! It was ‘Inbreeding’. Agents in the rabbit meat business initiated the problem and ruined the entire system. End result is loss for the farmers. Agents used to buy rabbits for meat from one farmer and sell it to other farmer for breeding. They used to put any 10 rabbits in a cage and sell it at Rs. 18,000-20,000/cage. It led to a complete chaos in rabbit farming industry and every farmer was doing inbreeding unknowingly. Kids born to same mother were allowed to breed further! Consequently 80% of bunnies delivered through inbreeding used to die within a month. End result loss for the farmer. It is vital to know the family tree of rabbits in order to avoid inbreeding. Solution for this problem is only one that farmers must buy bunnies for rearing only from genuine breeders. In order to train the farmers technically I have crafted a complete 2.5 hours training program that I conduct every Sunday. My aim is to see the rabbit industry flourish thereby I offer free training. The training program is re-set after the research ensuring farmers are well informed about ‘inbreeding’ and other technical intricacies of production and marketing. Training is divided into 9 steps. It begins with constructing shed, growing fodder, buying rabbits, crossing, breeding, feeding and disease management, treatment and marketing. To my trainees I give set of 10 rabbits and accessories at Rs. 18,000-20,000/set. In the set of 10 rabbits there are 2 male and 8 female. However I do not sell this rabbit start-up set to my trainees immediately after training. It is so because post training the budding farmers need 2-3 month for setting up their farm like construction of shed, growing fodder etc. In the meantime I develop rabbits for them. 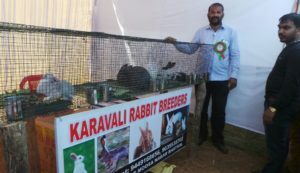 New Zealand white, grey giant and soviet chinchilla are the three rabbit breeds that are ideal for Indian rabbit farms. These breeds grow healthy and are easy for breeding. Within 4months these breeds of rabbits weigh more than 4kgs. Usually in one year healthy mother rabbit breeds 5-6times in a year. It delivers 6-8 bunnies. If rabbit is crossed today, then it needs to be checked after 8days. If everything goes well, within 28-30days it breeds. 2 days before delivery that is 26 days after crossing keep a plywood box (1 feet* 8inches) near the rabbit in its’ cage (2 x 2 feet). The day of delivery will be known as before 2 days the mother rabbit will start plucking its own wool/fur from its body to protect its’ young one. It will go inside the box and keep grass and wool and deliver. In case rabbit delivers in night then check in the morning to find out if it is feeding its’ kids. After this no one should touch the kids or mother for 30 days. After 8-10days, bunny opens eyes and from 15 days onwards it follows mother for eating grass and drinking water. It will perfect at the 30thday. The 31st day the mother and kids can be separated. Give rest to the mother for a week and then again for crossing can be done. Presently I am having 50 rabbits in my farm including bunnies and adults but I want to develop more to reach many more budding rabbit farmers. If I can get support from government or any social organization then I want to help every rabbit farmer earn good profits. Also I want to encourage youth to take up rabbit farming successfully with on-field training. I certainly want to stop inbreeding and want people to gain instead of losing. I want to see people grow!